There’s really nothing worse than turning up to an event and realising that you’ve left the ticket at home! By leveraging our comprehensive text and SMS messaging services, it’s not only that much easier to strengthen ticket sales, but also much easier for customers to gain entry. After all, you’re far less likely to lose your phone than a small stub of paper; SMS delivered tickets are more reliable and easier to use than the traditional alternative. Hundreds of entertainment and leisure venues are already reaping the benefits of making SMS a prominent feature of their customer communications. As the single most effective method of contacting your customers (according the Direct Marketing Association), with exceptionally high open and response rates, SMS is fast, measurable, personal, time-saving and cheap. What’s more, with Textlocal’s industry-leading innovations there’s now so much more you can do with your 160 characters; from easy to use loyalty reward schemes, to customer service enhancing surveys; the sky really is the limit. Take a look below to see some of the many ways that our bulk SMS messaging service can enhance the performance of your entertainment and leisure business, as well the enjoyment of customers. Join the mobile revolution with secure, trackable, highly customisable mobile tickets that can be sent out via an SMS, stored in your customers’ phones or Passbook apps, and redeemed in a wide variety of ways. Encourage repeat visits from your existing customers with an intelligent mobile loyalty scheme. Encourage ticket sales with exclusive vouchers sent directly to your opted-in customers’ mobiles via SMS. Got some empty seats to fill? Make the most of your unsold inventory by sending a quick offer to your opted-in database. Find out what your customers really think of your venue or attraction with our mobile-optimised surveys & forms tool. The unparalleled open rate of SMS means that your surveys have higher response rates for even better feedback. Include a short code and keyword in your marketing communications to build up a list of contacts that you know are interested in what you offer. Incentivise your customers to text in for even quicker growth. Include a link in your messages to increase the traffic for your website or to earn yourself some more social media followers. Use our short links tool to track clickers and see how effective your campaigns are. You don’t have to be sat on our website to send your campaigns. Email to SMS, API integration and our popular mobile app (available on the Apple and Android stores) mean that you can send your messages on the go. Our award-winning Messenger platform can be integrated with a huge range of software to provide you with a seamless SMS experience. Not technically minded? Don’t worry, our tech team are always here to help. 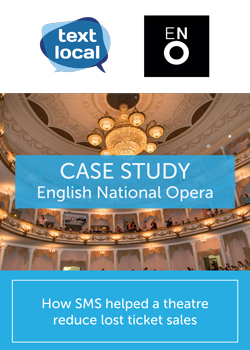 Download latest SMS leisure and entertainment case study from ENO. We have had great results from using text marketing, with many recipients making a box office booking as a direct result of receiving a promotional text.